I can only imagine a few of you are looking at this and saying “Oh, good grief, what is TESTHEAD doing now? !” To those, I can say “look at the title”. If you see “Aedificamus” in the title, it’s related to food, diet, exercise, and other activities associated with it. Eating is a huge part of the fitness puzzle, and in my opinion, it’s probably the most important part. Having some simple tools to help with food preparation can make for a much more positive experience. One of the discoveries I have made this year is the process of making “vegetable noodles”. I enjoy pasta, but a lot of the time, what I am really enjoying is the various sauces. The noodles often don’t really have much in the way of flavor by themselves (there are of course exceptions, but generally, plain noodles are bland). It’s with this idea that the egg and wheat noodles can be replaced with a variety of vegetables cut into noodle sized strips. Some of the best vegetables to do this with are a variety of squashes, potatoes, carrots, turnips, etc. Of course, getting them into the shapes of noodles can take some doing… or it can be as simple as buying a spiralizer. Spiralizers come in a variety of shapes and sizes. Some are motorized and can attach to other appliances. KitchenAid makes one that attaches to the front port on their stand mixer products, but that’s a pricy commitment for many, especially since a prerequisite is owning a KitchenAid mixer. For those who want to experiment with this approach, and don’t mind a little hand cranking, the Paderno Tri-Blade Spiral Vegetable Slicer is a nice, affordable rig to play with. – a straight blade, which will create long, uninterrupted flat ribbons. – a shredder blade, with small triangular prongs that make slices and result in thin, spaghetti sized noodles. – a chipper blade, with larger triangular prongs that make for bigger chunks (think french fries or curly fries). On the opposite side is a hand crank with a prong attachment to adhere to the back end of the vegetable being cut. The crank sits on a platform that can be slid back and forth, with a handle that can fold out to help guide the process of spiral cutting. All of this sits in a housing with suction cups on the legs that, when pressed down, holds onto the counter or another surface so it doesn’t slide around. I tested this out last night with chayote, which is a squash variety from Mexico. It held against the corer and the crank handle securely, and cutting the strips with the chipper attachment worked cleanly. There was no binding or forcing the cut. The blades made short work of the chayote and the result was “noodles” that boiled up fast, blended well with a basil tomato sauce and opened up a nice new way of consuming squash in a quick to cook format. This is the method that is often touted for making “spaghetti squash” and I intend to give that a try later this week. 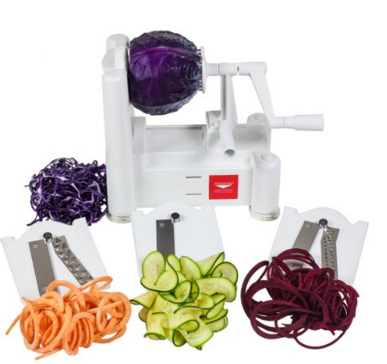 Clean-up is easy, just pull out the blade insert, run it under hot water, and place in some soap solution and hot water to sterilize, wash and dry the rest of the spiralizer, slip the blades into the base for safekeeping, and then the whole unit packs away in the same space as a stack of dinner plates. Many kitchen tools are either cheaply made and cumbersome to use, or they are elegant & well designed but expensive. The Paderno unit fits in a nice in-between space. It’s an affordable unit that works smoothly and feels sturdy (and safe). It packs down nicely, doesn’t require a lot of space to store, and is styled in such a way that, if you are one who likes having their kitchen gear on display, would not feel odd just leaving it out on the counter. Ultimately, any kitchen tool needs to feel comfortable and encourage use, and at that level, the Paderno Spiral Vegetable Slicer is a winner. If you are considering entering the fray of replacing traditional pasta with vegetables (even if just occasionally) this is a nice tool that definitely gets the job done.